A walking stick serves a number of uses. It is often used in hiking, to help navigate uneven terrain. It can also be used by those injured and the elderly for support and balance. If you have a lot of miles ahead of you, using a walking stick will help you cover more ground and will lessen the burden on your shoulders, knees, and feet. In a post SHTF scenario, it will also serve you well to have a walking stick as there may be a lot of walking involved to get to safety. You may also have to go through the woods, in which a walking stick would come in very handy. In this article, I will be covering the steps on how to DIY a walking stick. Some of the sections are optional and may not be applicable if you are pressed for time and don’t have a lot of supplies available. Selecting a stick may be simple enough but there are also things to consider if you want a sturdy stick that will last longer. This article will also discuss the other merits of a walking stick that can lead to a longer and healthier life. Read on to get started. It all starts with finding the right kind of wood. Hardwoods usually make the best walking sticks as they are the sturdiest. Examples of hardwoods are maple, alder, cherry, aspen, and sassafras. Look for a straight piece of wood that reaches at least to your armpit and is about one or two inches diameter. Your stick should not be too short and not too thick. Examine it for any signs of damage or decay due to insect infestation. Once you find a stick, test its strength by lodging one end of the stick inside a gap like in a tree and press it as hard as you can to see if it snaps. Be careful though as it may injure you if it breaks. As much as possible, do not take your stick from a living tree so as not cause further damage to nature. In addition, dead trees also provide more rigid branches. You’re bound to find one lying somewhere on the ground. To trim it the desired length, hold the stick upright with one end firmly touching the ground. If the stick is for your own use, hold the stick in a manner similar to when you are walking, with your arm bent at the elbow at approximately a 90-degree angle. Mark the stick at least two inches above your hand. Cut it at a higher length if you are planning to decorate your stick. If you are making one for someone else, let him or follow the same procedure and mark it at least two inches above his hand. When uncertain of the recipient’s height, a length of about 55-65 inches makes a good walking stick. Cut the stick using a hand saw or a large knife. For this step, you can use a pocket knife or any larger knife. Strip the stick first of any twigs before working on the bark. Whittling off the bark is not required but it is recommended if you want a smooth finish. Shave off the bark away from your body. Do it in quick, shallow strokes to avoid digging into the wood. It will take some time so be patient. Continue whittling until you see the bright wood underneath. You can try practicing in other branches first until you get the hang of it. The time it takes for your stick to dry depends on a several factors such as type of wood and environmental conditions. While fresh wood is easier to trim and whittle, dry wood is more rigid and durable. Drying also depends on sunlight and humidity. It can take several days, weeks, or even as long as one month. Let it dry until it becomes rigid. Don’t leave it out for too long though because it can become brittle. Check your stick once in a while to see if it’s dry. If you can spare the time and have sandpaper available, try sanding your stick for a smoother texture. If you want to go all the way, use a 100 grit sandpaper first, sanding the knots first before moving on to the rest of stick. Then, redo all the standing using a 200 grit sandpaper and later, a 400 grit. Once you are satisfied with your work, wipe the stick down with a lint-free cotton and Tung oil to remove any sawdust. You can also wipe it with a rag dipped in paint thinner. It is recommended that you use a mask and an n95 respirator while in a ventilated area in doing it. This step is not required but can be done if you have the time. You can personalize your own stick for identification and for your enjoyment. Using your pocket knife, you can put drawings, symbols, wood burnings, emblems, and initials on the stick. Decorating is usually done on the top portion but it’s up to you. It is also recommended to carve a grip into your stick to make it more comfortable to hold. If you want to improve the look of your stick and to preserve the carvings and initials you have decorated it with, you can seal it with a wood stain. Read the instructions on the package to know how many coats to apply, but it usually takes three coatings to achieve a darker finish. Let each coat dry overnight before applying the next one. Lightly sand the stick and wipe it in between applications. Then finish it off with three coats of clear urethane varnish. Similar to the wood stain coating, lightly sand the stick and wipe it in between coatings. The varnish will seal the wood and also prevent it from rotting. If you have not yet carved a grip in your walking stick, you can add one using leather, twine, nylon, o braided rope and fasten it with pins or nails. You can also secure it using adhesives such as the gripping wrap used in tennis rackets or golf clubs. Grip tape used in hockey sticks works just as well. This will be particularly useful if you have sweaty hands or if you want to have a firmer grip on your stick. The base of your stick is most susceptible to cracking, splinting, splintering, or rotting. You can place rubber caps used for canes and walkers over the end to help. They are available at your local drugstores or any store that sells medical supplies. You can also use rubber stoppers by drilling a hole both in the stopper and the stick and glue them together. If you want to take it to the next level, you can use a copper pipe to add more style to your base protector. Just cut an inch of copper pipe that’s about the same diameter with your stick. Whittle the base of your stick until it is able to fit inside the pipe. Apply a quick drying epoxy glue to keep the pipe in place. Now that you know how to make a stick, these are just some of the uses of a walking stick you may not have considered before. In times of danger, especially in a post collapse world, you can use your stick to defend yourself. There may not be enough time to grab a stone or weapon to protect yourself, but with a stick, you already have a defensive tool in your grasp. If you intend to use it for defensive purposes, make sure you practice. If there is an obstruction ahead such as a fallen tree and you need a boost, you can prop yourself up using your stick. The stick will help you maintain your balance as you step over this obstacle. When crossing a stream, your stick will serve as your guide to assess the depth of the water. It will also save you from slipping or falling into a deep hole ahead. When charting through the woods, you may end up getting lost and walking around in circles. But by marking the trees with your stick, you can prevent yourself from experiencing this mishap. In walking through a thicket, you can use your stick to keep twigs or leaves off your face. The stick is also good for clearing spider webs that may span the trail as you move forward. A walking stick, as simple as it may seem, can be a valuable tool you are eventually going to use for your survival. Even in the absence of a SHTF scenario, it is still wise to know how to make a walking stick, especially if you are fond of hiking or camping in the woods. It will make traveling easier, safer, and not to mention less tiring. Even if you don’t need one at the moment, you can try your hand in making one so that when the time comes, you will be more than capable to make your own. In the end, all you need is a good eye to find yourself a good stick and a way with knives and you’re all set. Have you ever tried making a walking stick yourself? Can you think of other uses for it? Tell us by posting a comment below. I like my walking sticks to be six and a half feet long. Locally, I use vine maple and hazelnut wood. Both woods also work well for emergency ‘hawk handles as long as your ‘hawk head is a traditional design. Another use is to use as a support pole for a tarp shelter, you can quickly secure a line at any heighth. I like my walking staffs long because They come in very handy when going downhill in rugged terrain, staff gets set downhill, and then ‘walk’ hand over hand for support while moving downhill. Very handy for mushrooming on hillsides and they move ground brush aside while looking for any ‘shrooms that may be hiding underneath. Walking sticks do not take long to become a habitual companion, much better than the synthetic, collapsible, mine just broke, models that are being sold these days. Add a hand loop by drilling a hole or by lashing,if you anticipate stream crossing’s. You can also store extra cordage on them by using a ‘whipping’ wrap. Inlet the end and add a button compass. Drill a longer hole in the top and add a fire steel and/or a few fish hooks and? Forgot one, a walking stick will usually provide some dry shavings to get a fire kindled as well. Your walking stick needs to be about the height of your head. It will then sweep up the spider webs that are stretched across the path. Nothing I hate worst than webs across my face. Great artical Pearl, Sometimes the best part of Making a hiking stick, is the hike to find the stick. The time you spend outdoors allows you to exercise your body, and mind, it also gives you time to practice your skills. How do you know your BOB, is complete, use it, leave work and drive to a wilderness area, and live out of it. If you have a twenty mile commute to work, plan a twenty mile hike with your BOB, test you’re meals, your calories per day, your rain gear, your sleeping plan. Remember, The best laid plans of mice and men, often go astray, so plan, then test, then evaluate, make changes, then plan….. I like your size suggestions . . thank you!! I love hiking sticks but my arthritis makes it difficult to hold anything (of any one size) that long. Any suggestions for making a hiking stick that I can use more easily? I made a walking stick several years ago and carry it every day as I walk my dog, but if we have a major event and I have to bug out on foot (a last case scenario I might add), I will not be carrying it. If things get that bad, I will be carrying my weapon. They are great for all the reasons listed and more. I use mine for stability, pushing away a loose dog and have rescued a few rattle snakes out of the road. I liked your article . You may want to elaborate on how to use the stick to mark trees for back tracking your trail. I also use my walking stick for hunting it helps steady a rifle especially when I place the muzzle of the rifle into the strap loop that is attached to the stick I also use it to steady a revolver too . 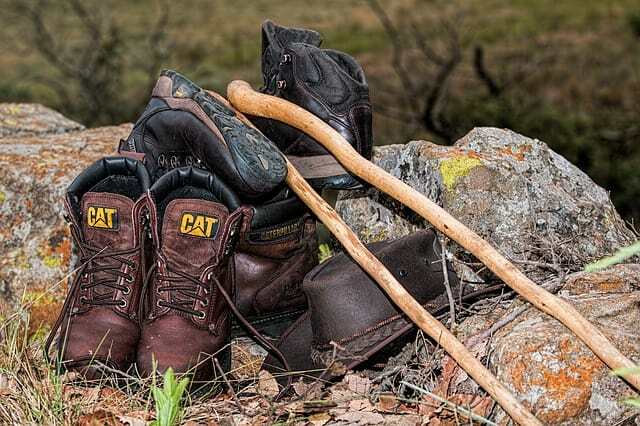 The survival items that Patrick M mentioned to attach to your walking stick are a great idea I have those things and more on mine (A small pouch attached to the to the stick allows you to carry other items as well ). If you travel in icy or snowy terrain, you need something on the end of the stick to grip the ice. A long decking screw works well drilled in at an angle. It can be used thru a rubber tip and backed out during the summer. An inexpensive LED flashlight taped to the stick can provide light on a trail and can be used to signal. I prefer a red light since it preserves night vision. A strobe feature might preserve your battery and signal if you fall and break a leg or hip. Taping it to the stick makes it less likely to lose it and the natural motion of the stick going forward lights the trail. I use plumbers insulated steam tape for my grip. Insulated pipe wrap will work as well glued on and secured by electrician’s tape. A fishing rod handle can serve also. I put a few feet of blaze orange surveyors tape on the end of mine in case I fall and can’t get up. It can mark your location if you pass out and can attract attention by waving the stick. I like hickory wood but it is heavy. I like 1 inch bamboo found at garden centers for it’s strength and light weight. I use my table saw set to barely cut to debark my sticks. Saves a lot of time. A rasp or rough file takes off knots better than sandpaper. Sandpaper and steel wool work well to smooth after the rough work is done. If you want to maintain a low profile, alternate stain with bright unstained wood. A wrist strap is handy when you need your hands free. A longer staff is better when jumping rocks to cross a stream or when the rocks are icy or slippery with algae. The staff should be strong enough to support your weight as you jump. If you carry a pistol with you, the stick can steady your aim. Stability is the greatest aid to accuracy, or so the Army taught me. If you want to get fancy, take a new ball compass and remove the pin. Drill a hole in the top of your staff or on the side at eye level and secure it with hot glue. I have read that the use of a walking stick reduces the energy needed by 15% and takes stress off your hips and back. One fact I omitted: if you dig up a sapling for your walking stick, try to get all the roots. They grow at an angle from the stick and one may make a nice handle if you make a cane. Also my dad was a mountain man and taught me walking sticks from child hood. 2 big reasons to walk with one is protection from dogs/animals and dangerous snakes. A good walking stick you can calmly guide them away from you. Maybe if you put a copper tip on your stick you could use one that’s threaded, insert an ice tip/ screw, and then screw another copper rubber ripped “cap” on the bottom. That way you could use your favorite stick year round. And I like the idea of having a compartment at the other end for a mini survival kit. Or a flask if that suits you better!